Firstly, throughout the referendum campaign the economic and social reforms introduced by Renzi’s administration since they took office in 2014 were placed at the centre of the government’s mission and of the PM’s campaign rhetoric. Yet, it takes time for such changes to produce tangible results and consensus. Secondly, the government’s narrative that depicted Italy as re-emerging from the global financial economic crisis clashed with the sluggish pace of the recovery, with the persisting difficulties faced by Italian families, and with a weakening of the middle-class. Within this context, the younger generations are facing a particularly critical phase, characterised by dramatic levels of unemployment. Thirdly, the political climate was (and remains) highly divisive. This is one of the effects of Renzi’s leadership style, which promoted the creation of ‘alliances’ between political actors of different hues, that hold very diverse positions but are ‘united’, at the same time, by a common foe: Renzi himself. In many respects, the socio-economic and territorial profile of the electors can (and has been) used as a lens through which to read the results of the referendum. Obviously other factors – such as the content of the constitutional proposals and the political identity of voters – have played a significant role. However, our analysis of the referendum will focus on the economic assessments made by the electorate. It shows how voters’ fears for the future were a major factor in understanding the ‘No’ vote. The electoral data collected by the Observatory LaPolis-Demos at the University of Urbino Carlo Bo shows the presence of three specific phases of the referendum campaign which was extraordinarily long, having been launched almost a year before polling day. At the beginning of the campaign in February 2016 ‘No’ had only a marginal level of support (32%, see Figure 1). By the second phase, the ‘mid-term’ period before the summer, support for No had grown by 12-13 points reaching 44-45% in June. In the final phase, at the peak of the campaign, support for No made a breakthrough. In October 53% of the electorate declared themselves against the constitutional reforms and this reached 58% in November. As this shows, support for the No campaign steadily increased throughout 2016. It is therefore interesting to look in more detail at the profile of Yes and No voters. Our analysis of the last voting intention data, collected two weeks before the polling day, and of the actual results of the referendum allows us to assess the main characteristics of Yes and No voters (see Table 1). The analysis shows that 62% of men (vs. 58% of women) and 64% of those with a high level of education (vs. 56% of those with a low level of education) voted No. If we consider the socio-economic characteristics of voters, for the most part the No camp attracted the support of businessmen and the self-employed (76%), as well as the unemployed (72%). The first category refers to individuals who are ‘independent’ in terms of employment but are, at the same time, ‘dependent’ on the dynamics of the market – thus, in a phase of crisis, they have been affected more than others by the impact of a difficult economic situation. The second category – that of the unemployed – includes for the most part, the younger generations. This section of society seems to look at its future with concern, and endures the uncertainties connected with the economic crisis, which undermines the stability of their everyday life as well as their future endeavours. Beyond this, it is also interesting to note that those with a stable position in the job market, who can benefit from the support of the welfare state, voted against the reform, i.e. manual workers (66%) and clerical workers (62%). Pensioners seem to be the only category that voted in favour of the reforms (55%). Students, on the other hand, reflected the national average (58% voted No). This could be explained by the fact that they are younger and, therefore, are still ‘sheltered’ by their families – and have not faced yet the difficulties related to the development of their own life projects. Our analysis by age categories reveals very interesting findings. For this purpose, we divided the younger generations into three groups: 18-24 year old, 25-34 year old and 35-44 year old. Breaking up the data concerning the ‘millennials’ – those who are aged 35 or younger – into two sub-groups, shows the presence of very diversified voting behaviours. 57% of the 18-24 group voted No – just below the 60% national average. In contrast support for No was distinctly higher within the 25-35 group (72%). This data is not dissimilar from that of the so-called ‘Generation X’ (35-44 and 45-54 year olds); two groups that voted against the reform in almost seven out of ten cases (67% and 68% respectively). Older age categories – the ‘baby boomers’ and ‘veterans’ – expressed support for the No camp that was below the national average. 56% of the 55-64 group voted against whereas 56% of the over-65s voted for the reforms. Overall, the findings shed light on how the Yes camp was more popular among the youngest Italian voters: 43% of 18-24 year olds voted yes. However support amongst 25-34 year olds was just 28%. Individuals within the 25-34 category are often defined as ‘young adults’ – due to the difficulties to emancipate themselves from the ‘ties’ of youth. In the context of the on-going crisis, they struggle to become independent from their families, in economic and ‘domestic’ terms. Two out of three still live with their parents – a figure twice as high compared to their peers across Europe. Within this age group, individuals also signal high levels of uncertainty about the future (62%), as well as a determination to emigrate to develop a career (72%) (Figure 2). A large majority (63%) also believe they will not be able to achieve or match the social position of their parents. This suggests that Matteo Renzi’s promise of a momentous generational change seems to have crushed against the frame of a long and continuous global crisis which places Italy’s ‘young-adults’ in a sort of limbo, waiting. They are no longer young but neither are they fully adult and they voted No because they struggle to put their future into focus. The reasons behind voting behaviour and choices are always complex, and are often unclear to the electors themselves. They also go beyond the socio-demographic traits of voters and their socio-economic positions. In the case of the Italian referendum, the ‘vote indications’ provided by political parties did play an important part in influencing the results and, therefore, the ‘economic factor’ should be understood as one determinant among many. However, the analysis developed here suggests that, beyond the role of party positions, other factors were crucial. How hopeful voters felt about the future was a key factor. Interestingly, 37% of those who think that 2017 will be a ‘better year’ compared to 2016 voted No, whilst this percentage rises to 61% among those who foresee a deterioration for 2017. Also 62% of those who think it is not useful to make long-term plans for themselves or their families because they see the future as uncertain and risky, voted No – whilst this percentage decreases to 41% among the ‘optimists’. 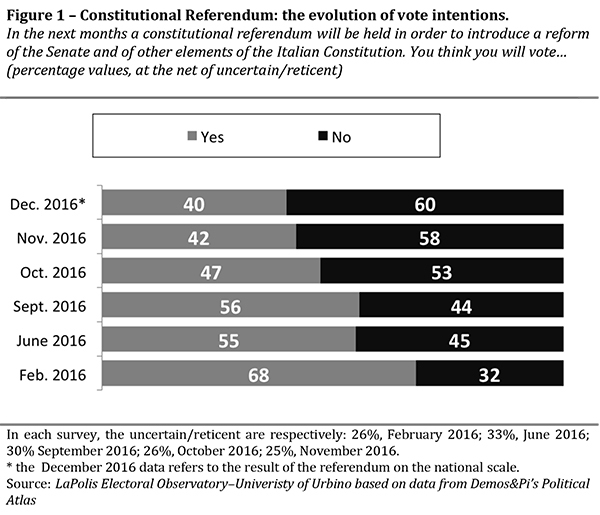 Furthermore, among those who do not welcome a potential exit of Italy from the Euro, 41% voted No. This compares to 71% for those who favour a return to the Lira. 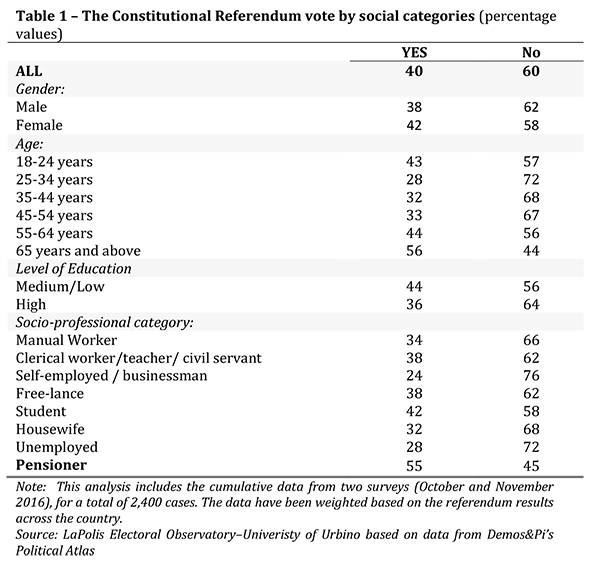 Thus, overall, the outcome of the constitutional referendum was influenced by a variety of factors. Economic considerations played an important role in determining the No campaign’s victory both directly influencing the individual voting behaviour and indirectly, through the parties which were able to interpret those issues and their underlying social drivers. Now, in the muddled political situation opened up by the referendum result, the Italian mix of economic suffering and political instability could provide some political actors with a new window of opportunity to increase their anti-establishment appeal.